It has been 20 or above for the last 2 weeks. The river has been melting from probably both sides. There is so much overflow on the river now that it is too dangerous to go on. I wonder if it will break up early. A lot of us use the river as a highway to go get our wood, so may be interesting getting wood later. Only good thing is we got a lot last year, so we are fine and can even sell some. We're big on mushing (we used to live along the Iditarod trail as well). All our snow's falling off the mountains. Looks like May out there. All the snow melted in Bethel. On the bright side, we're saving a lot on heating fuel! I am sitting here looking at 53 degrees on my thermometer. Has to be the warmest January I have ever seen in my 46 years here. 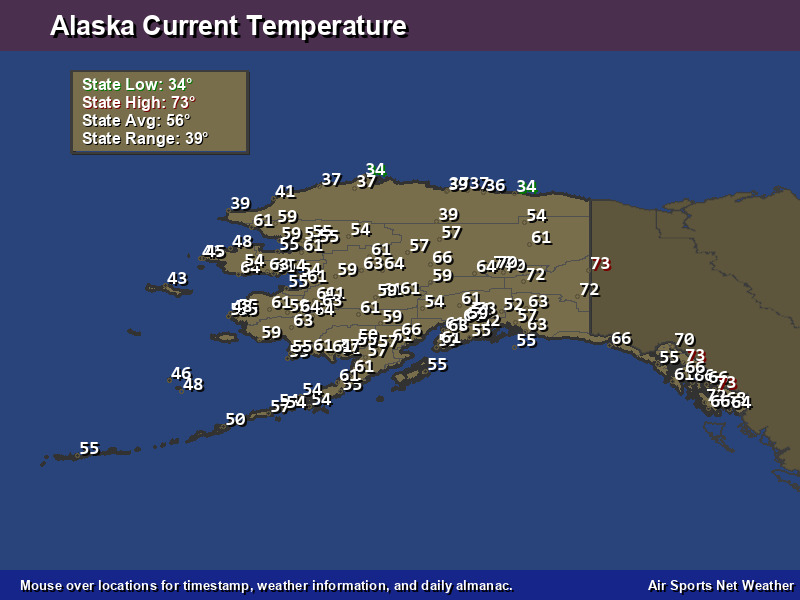 Here is a current pic of AK temps. It may update live, so the point of things being warm could be lost. The year without a winter... in Alaska. I guess Bering Sea Gold - Ice Season won't be filmed this year - if I read those temperatures correctly.